Scott Morrison the magician, illusionist extraordinaire, has made all Australia’s failing job & economic growth problems vanish in a puff of smoke and mirrors (with apologies to John Passant for stealing his phrase). He has created a grand facade of jobs springing miraculously from the presumption of Australia’s economically fertile soil. Drought resistant and immune to the emerging heat of anthropomorphic climate change (which was provided with no new solution in the 2016 Budget) our economy is expected to blossom with “-Jobs and Growth”. Prosperity is forthcoming to the families of Australia, except for those who are too lazy to earn over $80K a year! To cheers of “Hear! Hear!” amongst his colleagues, Morrison & Turnbull supercharged the great Australian dream of owning your own home. It is now, apparently, attainable by one year’s olds and children of financially well-endowed parents throughout the land. Not earning enough, then fret not! Our unregulated “scandal-free” banks will inflate your income on their paperwork. Hence your appearance as a newly minted millionaire will allow you access to funds you never dreamed you could have, much less pay back. Foreign investors looking at the bank’s books will loan us cheap money because they are too addled by the theatrics of our slight of hand. So hoodwinked that they fail to recognise a proliferation of highly leveraged loans. They barely acknowledge that countries where much smaller housing price to personal income ratios than Australia’s, have been characterised by collapsing economies. (Australian repayment rates in Sydney are 12.2 times the median salary) These lessons from history are nothing but smoky memories. Their amnesia over housing crises that have collapsed economies previously makes these investors inept at recognising our negatively geared Ponzi scheme. 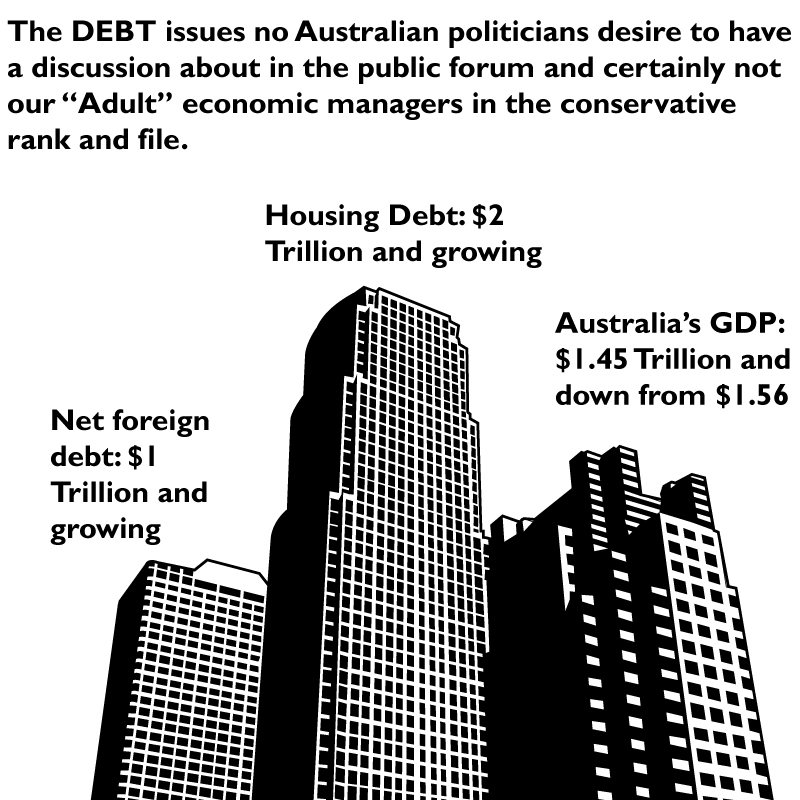 Certainly, no one pays attention to the fact that Australian mortgage debt is equivalent in value to 123% of Australian GDP. 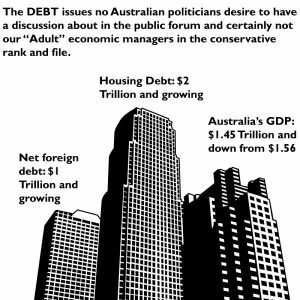 In the next term under the Liberals, we will all have jobs producing wealth enough for us to continue to support this mountain of debt? Wow! Welcome to Australia, a land of magic, miracles and illusion. Let us dazzle your senses, while we pick your pocket in search of some way to raise our revenue to maintain helicopter riding politicians’ out of pocket expenses. Budget 2016 was a menagerie of shameless self-promoting political aggrandisement and back slapping. All designed to create an illusion they have a magically restorative budget that will provide jobs for us all. But as any pundit watching a magic show wants to know, “how do they do that?” So let the revelation begin. The unemployed begins the illusion. That much maligned 10.4% of the workforce (April Roy Morgan stats) that the ABS desperately tries to sell you like 5.7%, so you don’t understand how significant the issue is. If a Newstart recipient works for so much as an hour (paid or unpaid) in four weeks, they are no longer registered as unemployed by the ABS. They still, although, may retain dole payments because they have earned little to nothing. Unemployed people who cannot declare they are ready to work immediately, whether because of other commitments or because they are so completely in a state of dysfunction that they cannot respond, are also eliminated. Hence single parents with responsibilities to children or disabled persons moved across to Newstart, simply don’t count and are not counted. 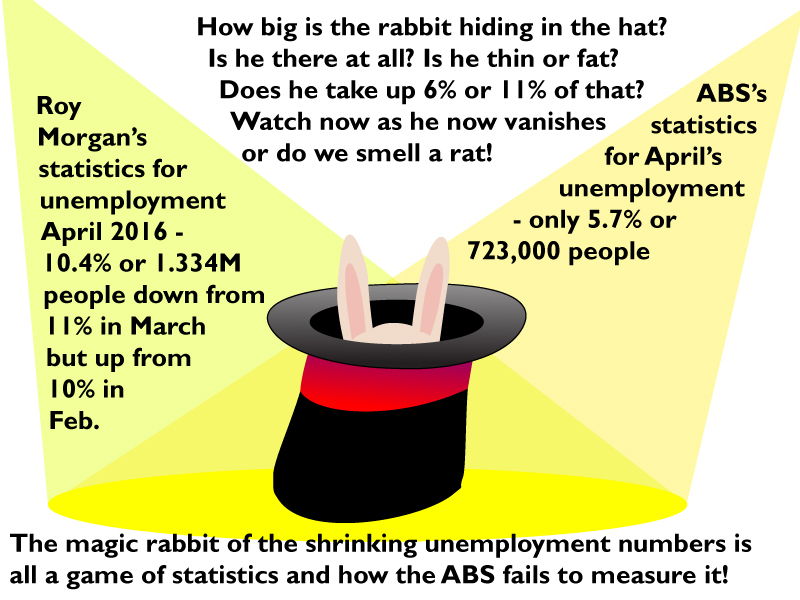 The ABS’s methodology hides the real size of the “rabbit” the Government is trying to keep under their hat. Contrary to some hysteria of $4/hr that social media is alarmed about; that is the $100 incremental rate change. Given the current single person’s dole rate of $263.30 a week after adding $100, the aggregate rate represents around $14.53/hr. That valuation is nothing about which to boast. It is still well below the poverty line. It is certainly less than the legislated minimum wage that was of concern to the Business Council. All for the aspirations of the unemployed who crave a chance at ongoing work for a fair wage. Why would not businesses take advantage of “PaTH” interns as free labour and simply churn through them? Michaelia Cash’s claim, to be able to block companies from doing that, outlines no viable strategy to accomplish this? Why might I suggest businesses will exploit interns? Because businesses already have!! So “internship” solves everybody’s problem! Satisfies those “communists” on the left wing of the Business Council of Australia, who want to pay unemployed youth more. The true believers on the right wing of the BCA are granted free labour for 12 weeks. All participating businesses get $1000 for each unemployed person they consume. Unemployment plummets because they have “worked” for more than one hour. The jobless vanish from the ABS’s books. Workers compensation is not required as technically; interns are branded as volunteers. The government has solved everyone’s issues in one single policy. Well except for the unemployed, that crave a real job. But then they don’t matter, as they don’t have the financial capacity to bequeath wealth as political party donations. The Rabbit has vanished, and the black hat is empty! Magic performed! The unemployed vanish beneath the ABS cloak of invisibility. Business’s unskilled, manual labour workload disappears as the unpaid fairies at the bottom of the garden do all the work. The government has apparently found more people work as they are less unemployed. Businesses are booming as costs are down, and CEOs can award themselves higher wages. Prosperity lavished on all. The last vanishing act will be the business profits as they are stashed overseas in Panama or the Virgin Islands. And that, dear reader, is how job’s growth is performed.